Mrs Ntukamazina is a Burundian biologist-environmentalist. She has a long experience of working with civil society organizations in the field of biodiversity conservation and sustainable development. 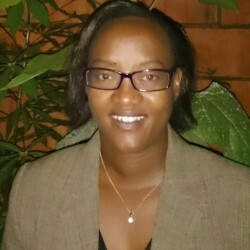 As Network Engagement and Partnerships Manager, Ms Jacqueline’s overall responsibility is to provide strategic leadership in the development, implementation and supporting a wide range of activities aimed at developing, strengthening and managing relationships with ARCOS Network and Partners to achieve the organization objectives. She shapes ARCOS Partnership strategy and key priorities to make it happen. Jacqueline loves reading, cracking jokes, and is fascinated by the discovery of life of human and animal populations. She also likes sports especially walking in natural landscapes. She detests lies.